How far will some go to safeguard a secret? In the latest novel in Dianne Freeman’s witty and delightful historical mystery series, the adventurous Countess Harleigh finds out . . . Though American by birth, Frances Wynn, the now-widowed Countess of Harleigh, has adapted admirably to the quirks and traditions of the British aristocracy. On August twelfth each year, otherwise known as the Glorious Twelfth, most members of the upper class retire to their country estates for grouse-shooting season. Frances has little interest in hunting—for birds or a second husband—and is expecting to spend a quiet few months in London with her almost-engaged sister, Lily, until the throng returns. Instead, she’s immersed in a shocking mystery when a friend, Mary Archer, is found murdered. Frances had hoped Mary might make a suitable bride for her cousin, Charles, but their courtship recently fizzled out. Unfortunately, this puts Charles in the spotlight—along with dozens of others. It seems Mary had countless notes hidden in her home, detailing the private indiscretions of society’s elite. Frances can hardly believe that the genteel and genial Mary was a blackmailer, yet why else would she horde such juicy tidbits? Aided by her gallant friend and neighbor, George Hazelton, Frances begins assisting the police in this highly sensitive case, learning more about her peers than she ever wished to know. Too many suspects may be worse than none at all—but even more worrying is that the number of victims is increasing too. And unless Frances takes care, she’ll soon find herself among them . 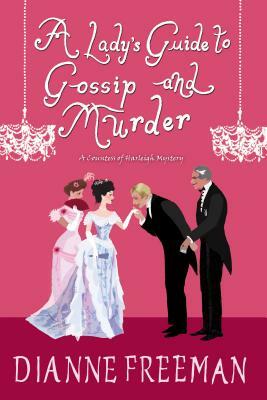 . .
Dianne Freeman is the acclaimed author of the Countess of Harleigh Mystery series. She is an Agatha Award and Lefty Award finalist, as well as a nominee for the prestigious Mary Higgins Clark Award from Mystery Writers of America. She spent thirty years working in corporate accounting and finance and now writes full-time. Born and raised in Michigan, she and her husband now split their time between Michigan and Arizona. Visit her at www.DiFreeman.com.